6 2019 is available in 7 different colors - Snowflake White Pearl, Sonic Silver, Jet Black, Deep Crystal Blue, Soul Red Crystal, Machine Grey and Titanium Flash Mica. The 2018 Mazda 6 is a facelift of the current model and is expected to hit the showrooms in Malaysia pretty soon. Recently, Mazda Malaysia did a preview of the updated model before the official launch which gave a much clearer picture of what it will be all about. Mazda has kept things simple and included subtle updates here and there. The Mazda 6 is already a fantastic-looking car, so Mazda decided not to poke around much with the aesthetics of the facelifted model. There is a slight revision at the front end. Now the chrome treatment that surrounds the uniquely designed front grille meets the spectacular LED headlights in a different fashion. Unlike in the current model, Mazda decided to make it flow under the headlamp rather above it. This does not sound much but it somehow manages to give the Mazda 6 a refreshed and more attractive appearance. Another element that we see in the 2018 Mazda 6 is the slim fog lamps in the front bumper. These are similar to what the Mazda CX-5 has to offer and look pretty modern. Mazda has also included a new design for the alloy wheels in the 2018 model. The 2018 Mazda 6 will be available in four trim levels. Thus, there are features that are available only in the higher variants. For example, the base model gets a 4.6-inch TFT display in the instrument cluster, whereas all the other variants get a colored screen along with a head-up display. Other features include 8-inch touchscreen infotainment system that supports MZD Connect system with voice command support and multi-function Commander Control switchgear, leather steering wheel, G-Vectoring Control, etc. Talking about the engine, the 2018 Mazda 6 will be powered by a 2.0-liter petrol engine that churns out 162 hp and 213 Nm of torque. We have another petrol engine that is more powerful. It is a 2.5-liter unit with 192 horses and 258 Nm of torque. This engine will be available in both sedan and touring variants of the 2018 Mazda 6. There is also a 2.2-liter diesel engine with 188 horsepower and a good 450 Nm of torque. All the engines will be mated to only a 6-speed automatic transmission and there is no manual gearbox available. 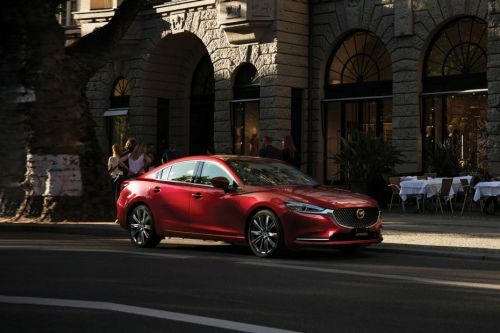 Surprisingly, in the latest Mazda 6, you will not find the torquey 2.4-liter turbo petrol engine which produces 250 hp and a whopping 420 Nm of torque. It is good to know that the 2018 Mazda 6 comes with safety features like six airbags and ISOFIX child seat anchor points, ABS, stability control, EBD and brake assist, traction control, emergency stop signal, hill launch assist and auto hold, as standard. The higher-end variants get some additional features that include speed-sensing auto door lock and walk-away lock function, adaptive LED headlights, blind spot monitoring, rear cross traffic alert, lane keep assist, lane departure warning, driver attention alert, and Smart City Brake Support. The current model of the Mazda 6 starts at RM 156,190. The pricing details of the new model have not been released by the company yet. Considering the additional features, we would not be surprised to see a nominal price hike.